Today’s Nice Price or Crack Pipe Range Rover has nearly 300,000 on its clock. Let that sink in for a moment—this is a Range Rover after all—then let’s figure out what it’s worth. China is a big country, with a huge population. Buick is a popular automotive brand in China and you’d think that’s because they offer capacious models like yesterday’s behemoth 1994 Roadmaster Estate. That’s not the case however. Today’s Buicks are a far cry from the Roadmasters of yesteryear, and that makes those older, and way-bigger models unique no matter where you hang your hat. The woodgrain paneled edition we featured was unique enough to garner a narrow but decisive 57 percent Nice Price win at its $6,000 asking. Big wagons may be an increasingly rarer sight on roads these days, but you know what’s almost mythical find? Why a Range Rover with over a quarter million miles on it that hasn’t had every part replaced two times over, that’s what. Look, let’s be blunt, Range Rover has never-ever been known for its reliability. They are pretty great in almost every other way, but in the realm of not letting you down they generally tend to… well, let you down. This 2006 Range Rover HSE however is an apparent outlier to that reputation. The odometer on this luxurious hunk of British Steel and alloy reads a remarkable 299,735 miles. And, those were apparently not racked up in traditional Range Rover fashion, towed behind a wrecker. The Range Rover’s third generation was developed during the short period of time when BMW owned the brand, but was finalized and marketed during Ford’s tenure. Fun fact: I’ll bet the majority of you had totally forgotten that BMW once owned Land Rover. The model took a lot of its subsystems from the German company’s parts bin, and those included its 4.4-litre M62 V8. With Ford’s ownership the truck’s BMW-ness would become much more muted. The M62 and available BMW diesel would quickly be replaced by a series of Jaguar engines as Ford moved Land Rover in with its catty island mate. This 2006 Range Rover is presented in HSE (High Specification Equipment) guise and rocks the Jag AJ-8 4.4-litre DOHC V8. That’s an engine that was good for 300 horsepower when new, but not necessarily for making nearly 300K without complaint. Behind that sits a ZF6HP six-speed automatic and that is said to have been recently repaired to the tune of $1,500. Phew, finally something on the car that’s worn out! Range Rover’s unflappable AWD puts the grip to the strip. Despite the monstrous mileage, the car seems to be in pretty decent shape. The bodywork is clean and straight, and there doesn’t seem to be any AWOL badging or trim. Even more remarkably, the interior hasn’t spun itself off into oblivion over the course of its use. Sure, all the tactile leather surfaces exhibit wear, but all the other elements seem to have held up admirably. Plus, who doesn’t love the Saab-like console-mounted ignition switch? Problems include a recalcitrant rear window and an engine bay that shows surface rust on pretty much every bracket and clamp. I think I finally get the reasoning behind manufacturers cloaking their engines in under-hood plastic panels. Despite the creeping crud, there doesn’t seem to be any major fault here, and geez these are very pretty trucks. The handsome seven spoke alloys seem admirably free of curb rash. It’s got that big funky air extractor thing on each fender side too, and that really looks tough. This generation of Range Rover ran from 2002 through 2012, and then the current Tata-funded successor took over. These may not be as classic an example as the original, but they make the second generation look like the half-assed attempt at a refresh that it truly was. And this one has made a trip to the moon and more. That’s got to mean something. Maybe owning an uber high mileage Range Rover is like finding a four-leaf clover, or opening a pizza box at a party and actually finding an unclaimed slice. Maybe, it’s magical. What would you pay for magical? In the case of this Range Rover, the cost is $4,900. It’s offered up for that on the Craigslist as well as on eBay, where bidding has gotten as high as $3,500. We don’t do auctions since we’re all impatient types and have ground to scratch and eggs to lay. That being the case, we’re going to have to go by that $4,900 Craigslist price in our voting. 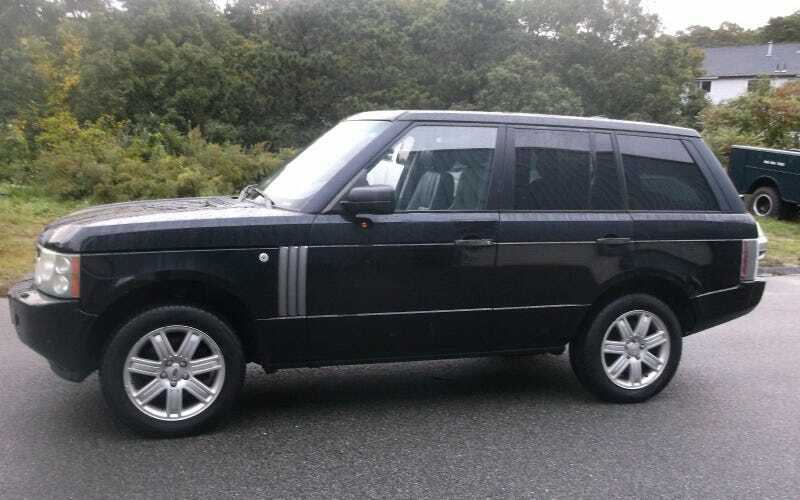 What do you think, is this amazingly high-mileage, but seemingly still in the game Range Rover worth its asking? Or, do the miles and the dollars just not add up? Cape Cod, MA Craigslist, or go here if the ad disappears. H/T to Matt77 for the hookup!